The models were predicting a strong area of high pressure to build across UK and Ireland for an entire week which meant settled dry weather and much welcomed warmth and sunshine and with no storms to chase or strong auroras in the offering (unsuitable moon phase anyway) I decided that this week would be the perfect opportunity to undertake an extensive training period with the Phantom 3 Advanced (P3) quadcopter/drone and get more flying hours under my belt and improve my filming techniques by training over different locations. The weather turned out nice and for several days mid week it was even glorious in places and it felt phenomenal to be out under the sky in a t-shirt in complete comfort, it was like Summer had arrived early. I filmed every single day of the week from Monday to Saturday averaging between 3 and 6 flights per day. For all of these flights I was flying line of sight and had a trained spotter with me, at times this was my Dad or else a friend with keen observational skills, this way I could fly with the app view on the tablet and with the naked eye but having my spotter provided me with visual cues so I could focus more on the filming aspect of the flight which made the experience even more fun and rewarding. During the course of the week I filmed Tullyhogue Ring Fort in Cookstown, Toome Bridge, Toome Flood Gates, Church Island at Lough Beg, five quarries, a tractor spreading lime, a close pass around a wind turbine and ended with a fly around Tom Duffy's Circus tent on the Dungannon road, however it is the quarry flights which I wanted to document here. Wednesday was the warmest day of the year, I spent the day in the countryside between Lough Fea and Draperstown parked on dirt roads which were bone try in the intense sunshine, and when I say intense I mean intense sunshine, once you are out in the open under a burning sun in the mountains for hours on a calm day you can really feel it working on the ground and on your skin, and I for one welcomed it. The sky was 100% clear and deep azure blue with not a single cloud visible on the horizon all around me, conditions were absolutely perfect for flying so I took my time and enjoyed every minute of the experience. I was standing in a beautiful green field with my spotter on high ground with a fantastic 360 degree vista all around me with flat lands to the S and the Sperrins to the W and a few meters away was the ancient Ballybriest Stone Cairn. I got set-up, calibrated the compass, got a strong signal with GPS detecting 20 satellites then took off above the field, over the road, over the fence around the quarry and climbed up and panned down to explore. This was Northstone Materials Quarry, it was early afternoon and the sun was burning the back of my neck and the quarry was busy with trucks coming and going and big alien looking machines doing their business, this suited me fine because the noise from the machinery would block out the buzzing sound of the Phantom allowing me to fly unheard and likely unseen due to the craft's height and small size against the bright sun. 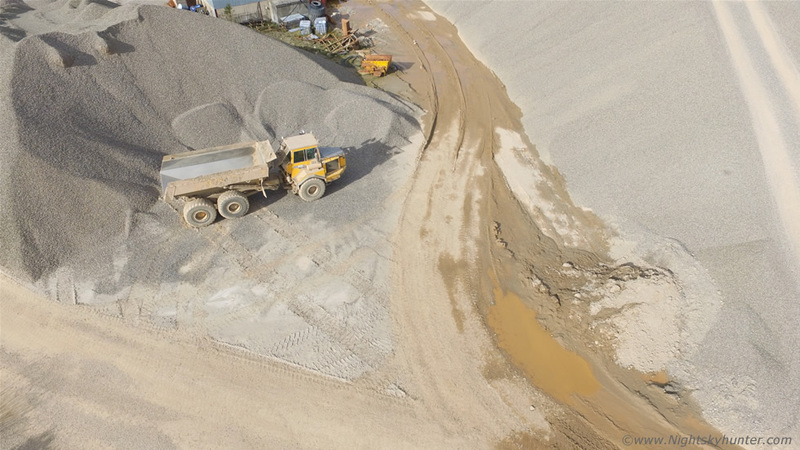 These are 12mp stills, the good thing about having a drone is that assuming its relatively calm you can 'park' the craft anywhere in the sky, compose the scene and take your images, you can do this on auto mode for have manual control over shutter speed, ISO and exposure compensation adjustments, it really is just like a floating camera powered by your own imagination. Watching these massive sand washers at work was fascinating, especially from a view point not many other people get to see. 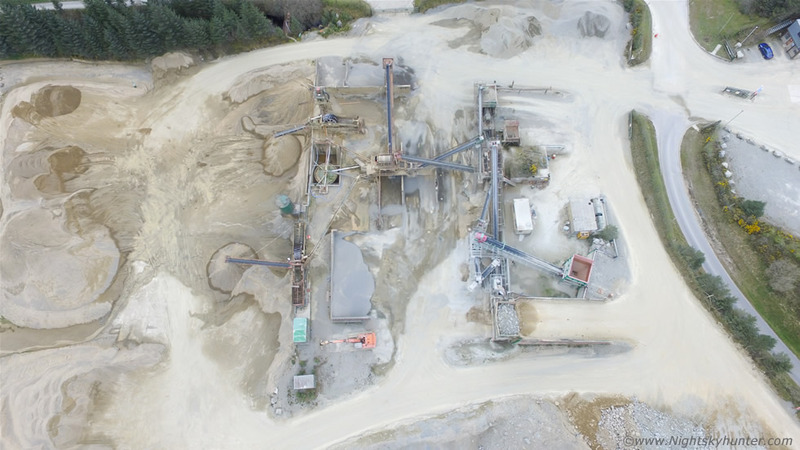 The site looked impressively complex with wonderful textures and colour tones to the sand and stone piles and lakes, the machines themselves looked like some giant insect, it was like flying over an alien landscape in the process of being terraformed. 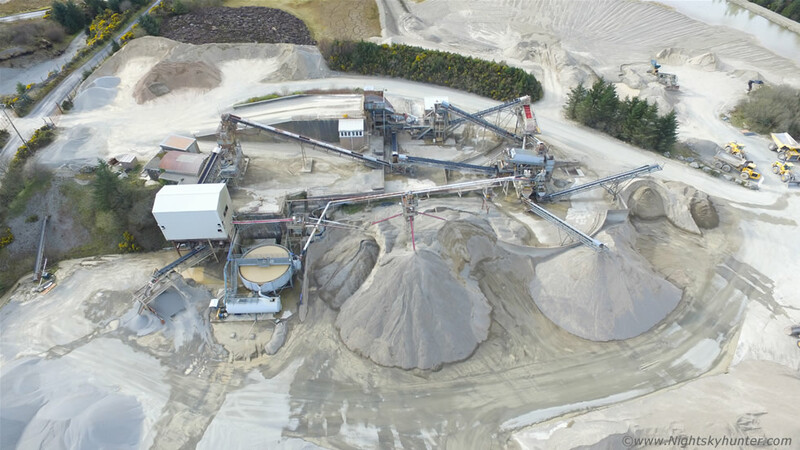 Full flight video of Northstone Materials Quarry including a quick pass over Ballybriest Stone Cairn towards the end. It was a thrilling experience floating over those hills, lakes and machines watching the yard at work and thanks to the warm temps the battery seemed to last forever and I was able to land with two bars of light. 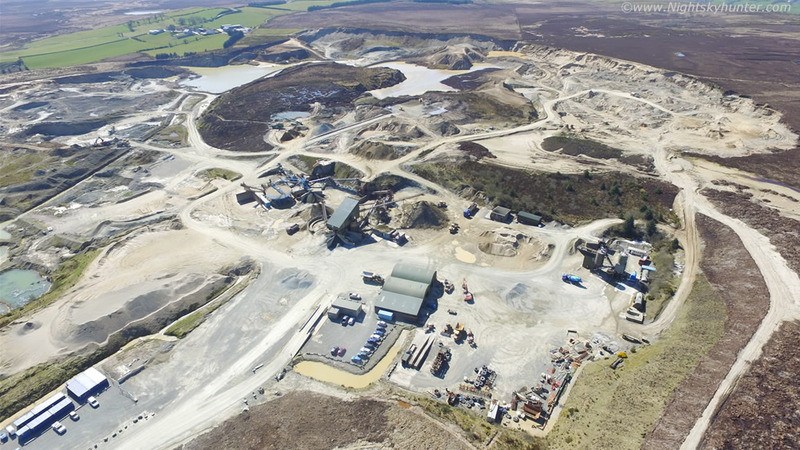 Our viewpoint also showed Creagh Quarry in the distance, it looked very big and even from this range we could see huge columns of dust rising high into the sky, it looked very exciting and I couldn't wait to see what it looked like from above. We got in position off the mountain road, hiked over rough ground and set up behind a formation of beautiful yellow gorse bushes, got calibrated and yet again a great signal and safe to fly, I set up two chairs, then I took off. Creagh was a good distance away from the road so I had to fly across quite a bit of land at low altitude then when I entered the area of interest I climbed in height and hovered to take in the view. This was a massive area with a large array of machinery and extremely busy. Trucks arrived and others left with trailers filled with sand and other products, I even followed some of the trucks as dust got kicked up into the air from their busy wheels, the dust was very dramatic to watch and reminded me of the opening scene of Convoy. 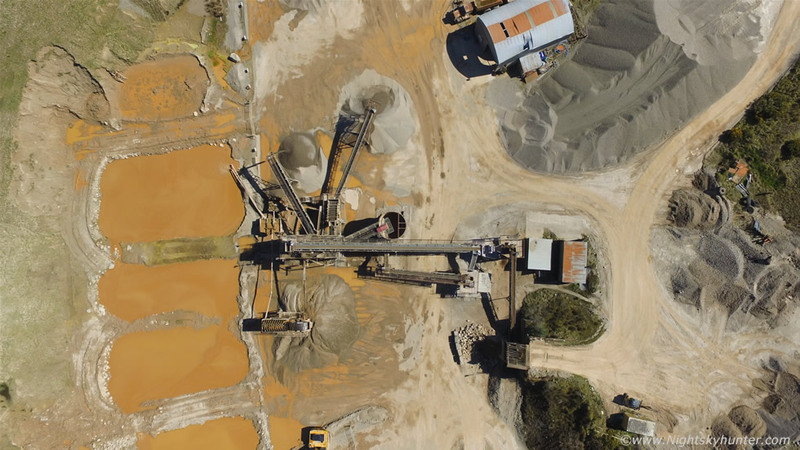 I actually did two flights over this location, the first was the longest as I watched everything below then did a relaxed 360 degree wrap around the complex admiring the sand washing machines and layout of the landscape. As I flew sweat was running down my face due to the exposure to the sun, I was actually getting shivers on my arms from my first sun burn of the season. You can appreciate from these images just how high the dust was lifting into the air, I estimate at last 80ft high, it was clearly visible in towering clouds in the blue sky and passing over the high sun from my ground based vantage point. This area is a drone pilots perfect location, it is vast, interesting, flat and nothing tall at all for miles around, no power lines or tall trees, even without a spotter I would have no issues flying and filming here on my own with nothing to worry about. I landed with two bars of battery left and powered down the craft and just as I did so a massive dust devil formed and moved rite through the quarry and over the sand dunes and diggers, it was a good 50ft tall and rotating swiftly and was stunning, I couldn't believe it, had I stayed in the air another five minutes I would have had it on camera, now that would have been some sight. 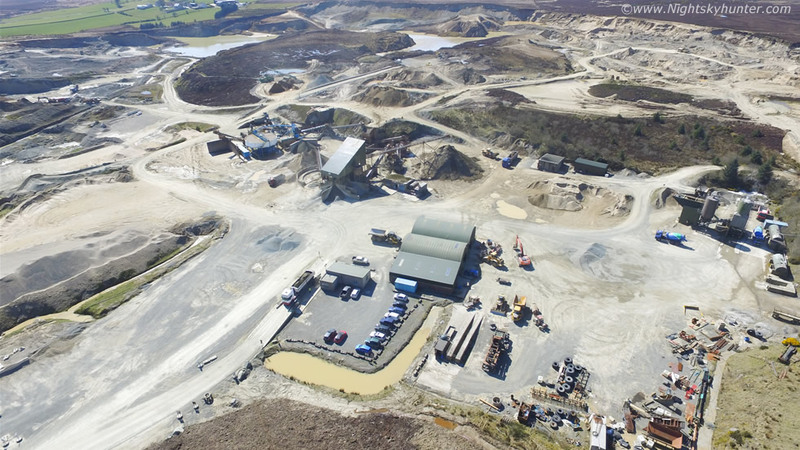 Both flights over Creagh Quarry, at times I was sure I flying through the diffuse upper portions of those dust clouds. When I returned after flight two we were packing everything into the van when a smaller dust devil (car sized) passed rite across the dusty road 20ft away from me. I enjoyed this day immensely, I spent hours out in the sun watching the landscape and skyline, soaking up the rays, exploring the back roads into new territory which might become useful for future storm chases, I also returned home with an obsession with filming quarries from the air and wanted to try it again in the very near future. The very next day I went out with my spotter on the hunt for another quarry and there really wasn't much difficulty in making the decision where to go for McCanns quarry in Knockloughrim was just up the road, I had past it many times but never seen what it was like on the inside before so I was eager for a bird's eye view of the complex. We found a back road on high ground, went over a gate and through a field which led us to the very top of the quarry (caution: always be careful when near quarries as they are extremely dangerous!). The day was warm and sunny however there was a keen NEly breeze blowing which was accentuated at this elevation, we had to be careful because we didn't want to damage the Phantom. There where bushes behind us so if I went straight up I could be blown back into them so I was ready for this, we launched from behind a stone pile and I flew upward and forward to counteract any opposing force from the NEly, I then flew high and into the wind, this was good because it meant that on the return flight the wind would bring us home quicker using less battery power, I don't like it when it's the other way around. The live view through the tablet was breathtaking and as I panned the camera down I felt my stomach summersault, when you look through the real time view of what a drone sees you actually feel like its you up their flying and not a machine, it's an amazing experience and quite beyond description really. 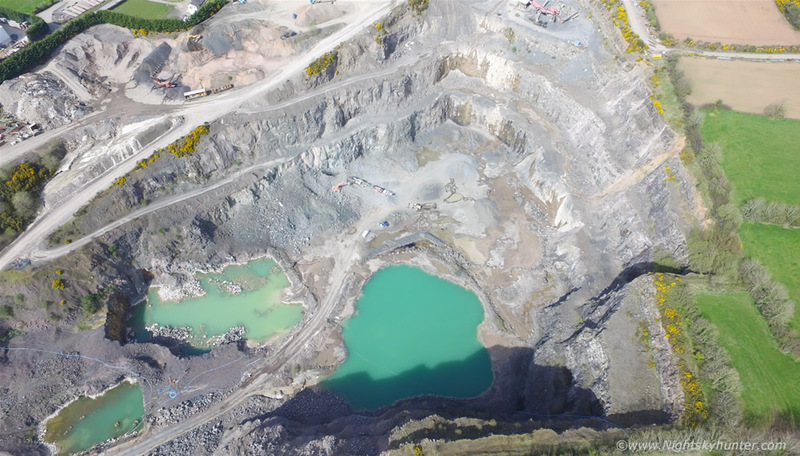 Due to the keen wind I couldn't try out some of the things I wanted to so I stayed high and took images and video, the green lakes at the bottom looked beautiful contrasting against the stone surroundings and the multi layered concentric structure around the pit was most impressive, I was showing the screen to my spotter in an excited voice saying ''look at this view!!''. 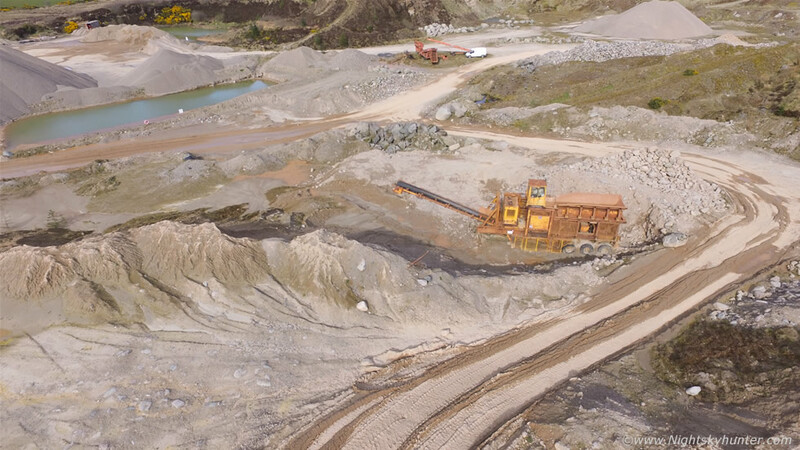 Check out the size of the trucks at the bottom of the pit for a sense of scale, this quarry truly is massive and it will take some beating, I would say without question that McCann's have the best. I was at the CAA regulated 120m hieight restriction where I launched from but because I moved over this massive hole in the Earth that meant I was much higher, however in regulation terms it doesn't matter because the height is calculated from your launch/calibration site, had I launched from inside the quarry and upward then it would have been a different story. 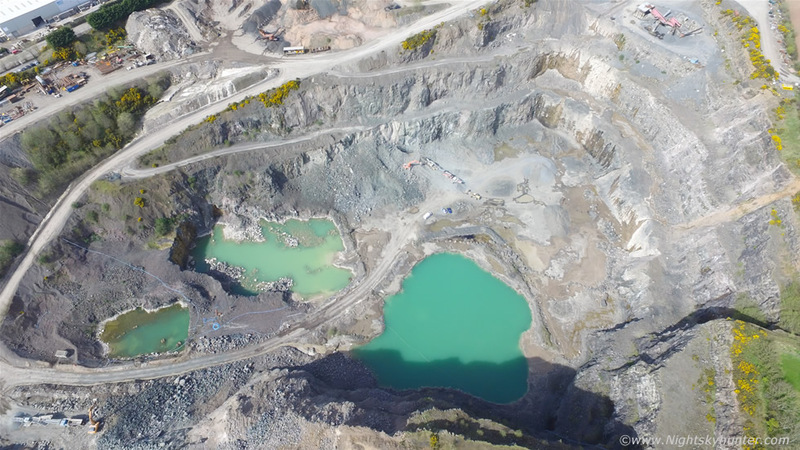 Full video of the flight over McCann's quarry which was the most impressive I have flown over to date and a place I would like to return to another time on a calmer day and lower sun angle. 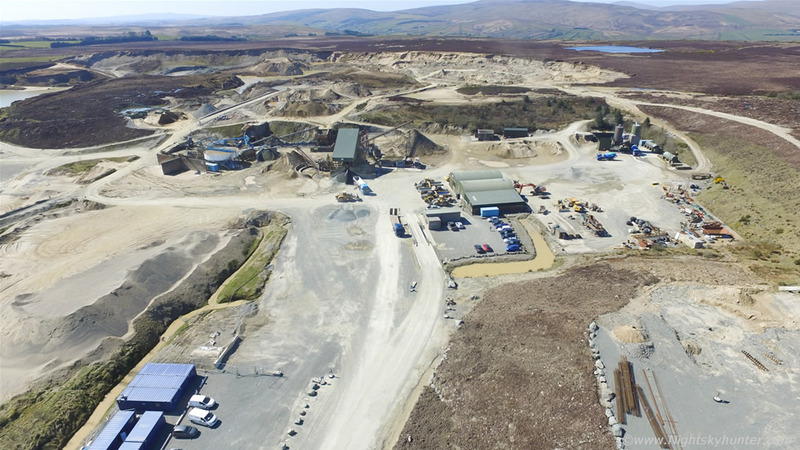 That very same afternoon we hit the back mountain roads outside Draperstown and did a return visit to Northsone Quarry near Balybriest road. It was nearing closing time and with the exception of a last minute truck leaving the site everything was quiet with most workers heading home. 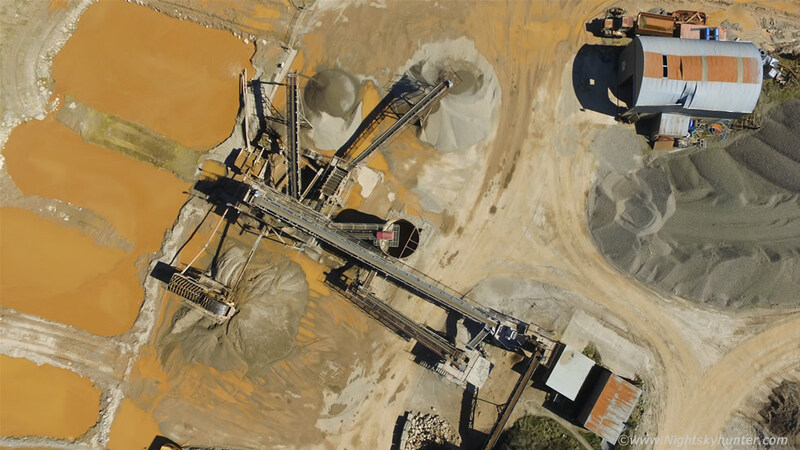 This was a great flight in calm conditions and the battery seemed to last a lifetime, I explored the other end of the quarry checking out dunes and abandoned loaders. It felt like I was flying across the surface of Mars, this rusted stone crusher looked really cool so I had to take an image. After this we did a close 360 degree wrap around an isolated wind turbine then relaxed in the sun with a partial sun halo on view then it called it a day, I arrived home with what felt like dust in my eyes, nose and mouth. 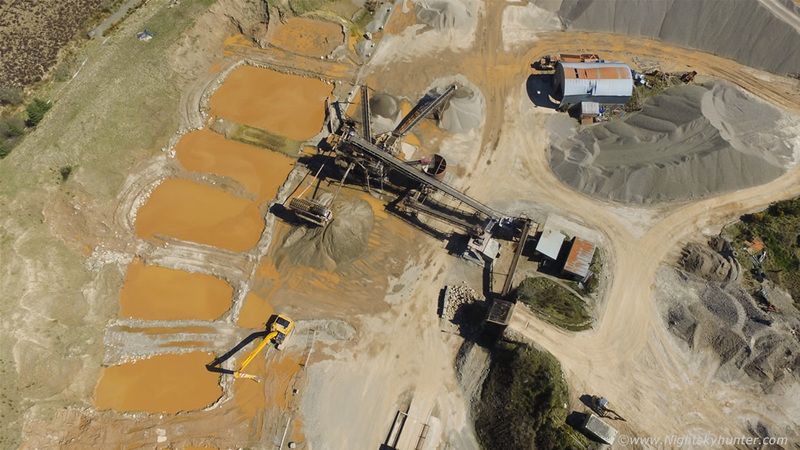 Full video of the return visit and aerial exploration of Northstone Materials Quarry, there is a cool scene when the P3 was hovering above the sand washing machine and two workers meet below for a chat. On Saturday afternoon I teamed up with my Dad who would be my spotter and we hit the road once again to check out several new quarries. This would be the end of the good weather as the following day would see the arrival of a cold front and trough bringing with it a new week of very cold weather and wind so this would be our last chance for a while. The day was cool with a Nly wind which was keen and overcast skies mixed with hazy sunshine so the light was a little flat however we where up for the challenge anyway. 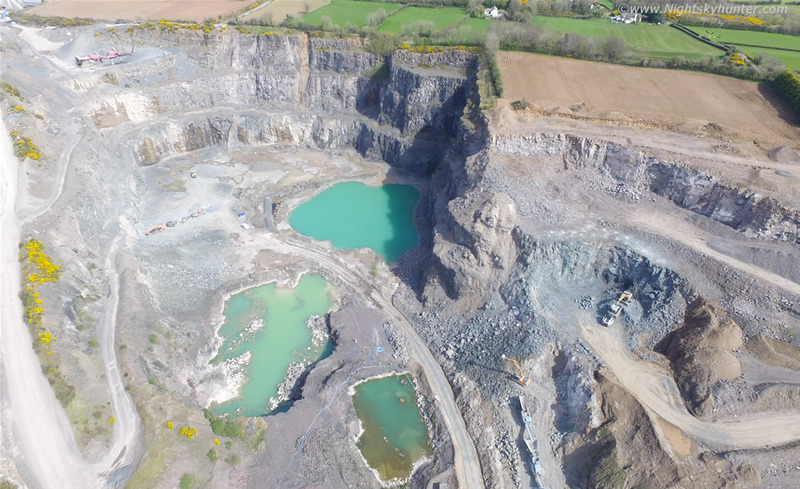 We filmed two quarries this day, this was the first, I cannot recall its name however it was located deep in the countryside near Beaghmore off the Omagh Road. We launched from the lip of the quarry walls near the road with perfect line of sight view across the target. A shower arrived in mid flight and rain drops got on the camera lens so I had to return, clean the lens, wait for the shower to pass, then took off once again in drier air. I only took one image from here as I was mostly concentrating on video, the plant had shut down so all was quiet and at times it felt like flying around a ghost town. While driving across the back roads heading for our second destination near Lough Fea we spotted a nice sun halo so we pulled over for a look. I have been observing and photographing atmospheric optical displays for 20 years and have always had a keen interest in spotting an unusual or particular dramatic formation. 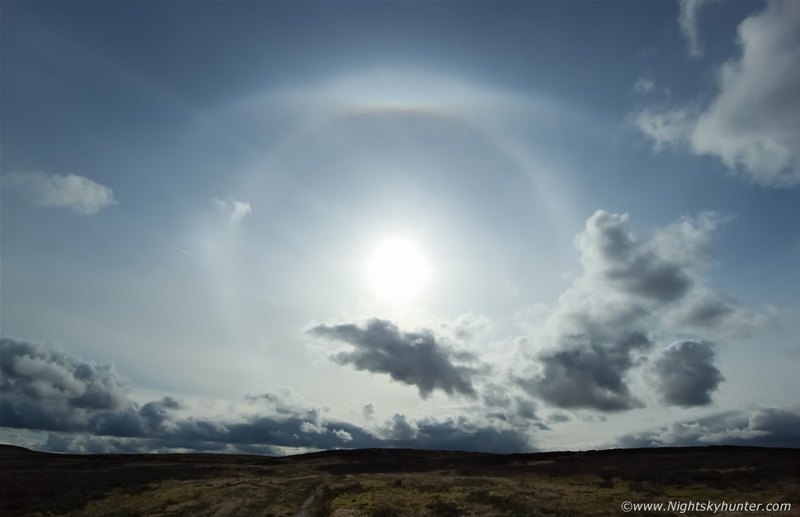 This was the best halo I had seen for a long time, it was a complex formation and I was immediately struck by it's appearance. 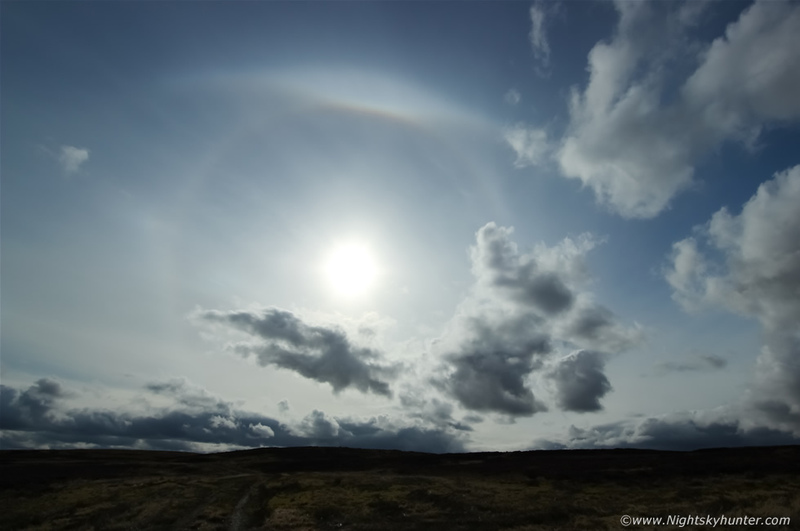 These images were taken with the DSLR at 10mm wide angle, on view is the common 22 degree sun halo, to the left is an eastern 22 degree sundog however of primary interest is the intense upper tangent arc on top of the halo with a parry arc/suncave arc, together they formed a lens shaped structure with curving wings on either side, that formation alone made this an impressive catch and of a much more rare nature, was I impressed by this? - you bet I was and I was glad we made the decision to pull over and shoot. I only had it in view for five minutes as cloud was thickening and we were loosing the sun then it was gone however I managed to get half a dozen images before that happened, the lens was stopped down to F/11. The sky was grey and the wind was strengthening and blowing in an unpredictable fashion so we made our last flight a short one before the weather went down hill further. 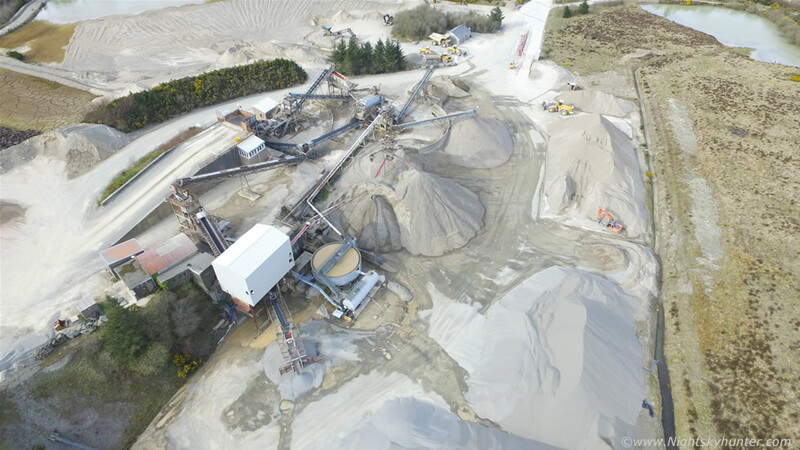 This was the sand quarry beside Lough Fea, again it was closing time and all was quiet except for the wind blowing the metal gates back and fourth which made loud squeaking/banging noises. I did a 180 degree wrap, an overhead pass with camera tilted down then lowered down for a look at the trucks then returned again, it took us a lot longer than usual to hand grab the Phantom due to the wind however we eventually got it down safely and all was good. 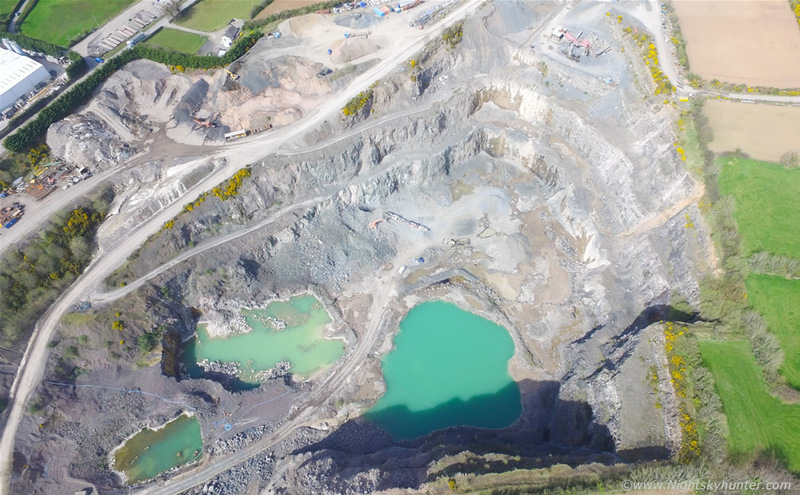 Full flight video of Beaghmore and Lough Fea quarries filmed in challenging wind conditions. At this point in time I am absolutely loving filming with drones and I can see these playing a big part in my future so I will do my best to keep filming interesting landscapes, unusual events, and dramatic weather to compliment my ground based photography. Thanks very much for viewing.